The stuffed vegetable needs no introduction, especially to anyone from around the Mediterranean or in the Middle East. The farcis, dolmades, yemista, mahashi/mehshi – all can be exquisite examples of a country’s cuisine. Heat-softened, spoonsful of tender herb-flecked grains pressed into the hollowed out spaces – humble, easily grown vegetables elevated to the centre of the plate. Laid out on a long, well-scrubbed wooden table, underneath the only shade for miles around, who could wish for more than plates of stuffed vegetables, a chewy round of bread and a few friends with whom to share it all. As I type, the sun streaming in the windows – bright yet not at all warm – I am fantasising of early summer courgette blossoms swollen fat with ricotta, and of halved and singed aubergines, glistening with best oil and smothered in local, weedy herbs. Oh yes. This rough and ready feast and a bottle or two of fruity and spicy red or herbaceous white would always, always, be welcome. Hmmm. As you can tell, I am far away. At least in my head. But – Earth to Kellie – stuffed vegetables can be a bit, how shall I say it, naff. Or, if not naff, then slightly unwelcome. Come on, we all know it is the (dreaded) vegetarian option on the plane. At the wedding. At your nan’s. It’s kind of like saying, well I know you don’t eat meat so we will just hollow out a vegetable and fill it with some starchy carbs and cheese. You’ll like that, won’t you? And here I am contributing to such vegetable insouciance with a stuffed vegetable recipe. I have form on this. But as with my recipe for chermoula and sardine-stuffed tomatoes, I am guided in this recipe by my near-insatiable quest for punchy flavours and contrasting textures. 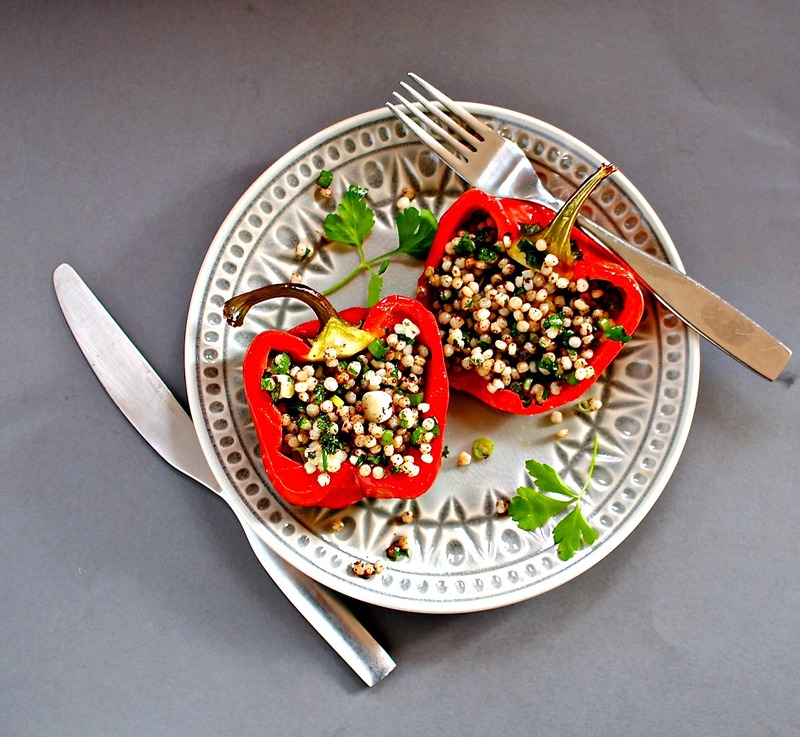 Invariably fixating on tastes from the Med, Middle East and – big scope here, I know – Asia, my taste buds’ roving desires need not a trestle table banquet, but a pepper. Or courgette. Or firm, fat and scarlet tomato. The wine is always a good idea, but not strictly necessary. 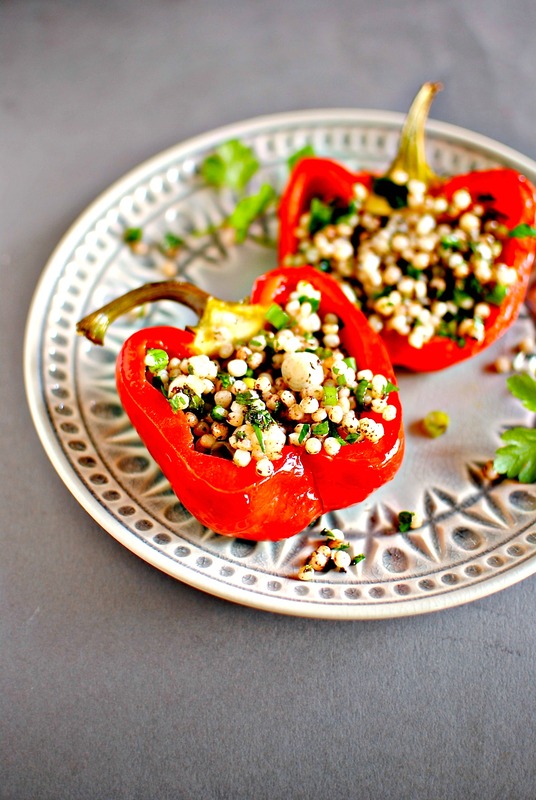 Recently I prepared a couple of versions of these peppers for my cancer nutrition groups, catering for both those who want and need healthy fibre, and those who are fibre-restricted. With these lovely folk in mind I have purposefully written this recipe to be flexible: rough measures, options for the grain/seed, skin or not. Let your own needs and tastes guide your choices. I am not the recipe police here. So, this is an easy recipe for pleasing most anyone who will eat vegetables. You could of course add a little seasoned and well-cooked lamb mince as a meaty, savoury garnish: A volte-face from many recipes where meat is front and centre, with veggies, herbs and whole grains playing second fiddle. But trust me, even if you love meat (and I do like it, just not often), you will not miss it here. When the sun is less feeble, and I have shaved my legs and rubbed in some fake tan, I hope to have these under my own tree. In the meantime, a plate of these guys and a sweater will have to do. Make mine a white. I recommend blanching the peppers in just boiled water for a few minutes before drying and popping on a tray to roast. I have found that this ensures the peppers are evenly cooked without roasting too long in the oven. If you have another tried and true method, do that of course. I have given the grains as cooked so this can be done with leftovers (I keep a stash of cooked grains in the freezer) or even good quality ready-to-eat grain mixes. Otherwise make up about a cup (raw volume) of your chosen grain and use what you need from that – depends on the size and quantity of peppers you are using. These are great warm or cool, but I think they aren’t so good straight from the fridge. Chop up any leftovers (the whole thing) and toss through a salad, or even to a good broth for a quick soup. *In my images you will see giant couscous – not wholegrain. I was accommodating people who could not handle too much fibre. Whole grain/seed such as quinoa is preferred. 1. 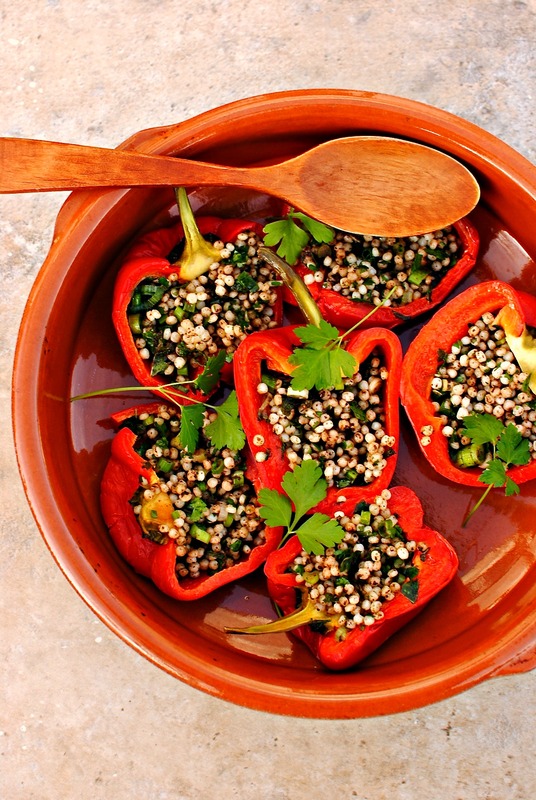 Pop the pepper halves into a pan or heatproof dish; pour over just-boiled water and cover. Leave for three minutes. Drain the peppers and dry. 2. Spray a baking sheet with a little oil, place the peppers cut side down on the tray and slick with a minimum of oil. I’ve done it without oil and I prefer them with just a little oil, but that’s up to you. 3. Roast at 180C/350F for 12-15 minutes until the skin just starts to bubble and no more. The blanching has made sure the peppers have cooked on the inside so just roast in the oven until just starting to barely colour. 4. While the peppers are cooking combine all but the seeds in a small bowl. When the peppers are done and have had a chance to cool down, spoon the mixture into the peppers. Sprinkle with the seeds and serve at room temperature. Goes well with salady bits and good bread, but also with grilled fish or meat. Think Mediterranean! Note: You can do these in advance, chill them and remove from the fridge to come to room temperature, or even slightly warm in the oven with foil on. For lower fiber: Roast a few minutes more then pop into a bowl and cover with cling film for 10 minutes while still hot. 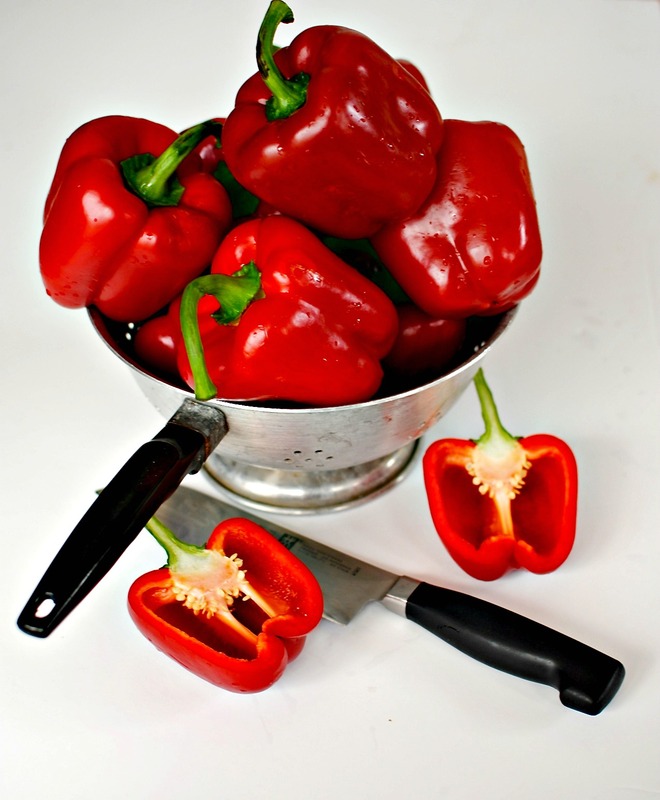 Carefully peel the peppers with your fingers or a small paring knife. The peppers will be quite floppy so after you have filled them you will probably need to pin them together with cocktail sticks. For the filling, use white rice or something like giant couscous (seen in the images) – whatever is permissible on your diet and mix in some feta cheese and a tiny bit of dried mint you have added a drop or two of water to (rehydrating it). If allowed, top with a bit of peeled, seeded and chopped fresh tomato. I am happy to submit this to the lovely Karen of Lavender and Lovage for her popular Herbs on Saturday round-up, and to Mark of Javelin Warrior’s Cookin’ W/ Luv for his Made With Love Mondays. Thank you Karen and Mark! Oh I am making this, sounds and looks so good. I love colorful food! What I love about stuffed peppers is they look so appetising. Even if they may have a predicable quality to them , I love how they can be transformed by the use of a new and fresh flavoured filling. I also still love Piedmontese peppers. I love to add rice and mint and sometimes dried fruit. This is making me wish for summer evenings and meals outside and some lovely Rose form Provence! Thanks so much Miss Liz. I wish I could have one (or two, plus a glass of wine!) with you. Lucky you, Elaine. the US route with US carriers is as you might expect. I will leave it at that! But the airport I fly through to get to Florida is even worse. By the time I get to either end I am desperate for something with a healthy crunch and is salt-free! I can easily imagine…I always carry bags of peeled and chopped carrots for that very reason!! These look really delish. I love the shape of the cross-sectioned peppers, they’re like little sculptures! Also, your plate is so nice! Super time-saver and rescuer of many meals. That and frozen cooked beans/lentils. I hope you try it, Petra. Cheers for commenting. Beautiful dish. A Spanish guest post inspired me to make stuffed peppers last month too. But I love your use of giant couscous and tapenade here! Oh, what was in yours, Katie? Did your guest offer any authentic suggestions? Mine version had quinoa, currants, goats cheese, dill, and pine nuts. So not quite authentic. But Maria was part of a wellness series, so she offered many authentic suggestions on life 😉 and for the stuffed peppers. They typically use piquillo peppers and finely chopped veal as a filling with a thickened sauce of stock, carrots and onion to pour on top. She said they’ll also use any leftovers as a filling. That sounds delish! Roasted peppers inspire so many combinations although truthfully I’m not desperately keen on sweet in mine (I know, what a weirdo) although nippy barberries I love. Thanks for link. This looks amazingly tasty! I cant believe I have never come across giant cous cous before… but I bet quinoa is lovely too. Thank you for inspiring my uninspired dinner planning! #TastyTuesday Vegetables may not be top on many people’s dining list, but this recipe looks amazing…. I know what you mean about the dreaded stuffed veg being the one sad vegetarian item. And what is with airplane veg meals? My last one was a potato curry with a side of rice. Where are they getting their nutrition info from?! I like the idea of these stuffed peppers with a whole grain and a bit of feta, and the tapanade sounds lovely as well. Filing these away in the must-make department! I a very happy to eat nearly 100% veggie most weeks, but I DO struggle with vegan as I LOVE cheese! However, as a BIG fan of the “stuffed vegetable brigade” these peppers still ring my taste bell! These look so colourful and fresh – if only airline stuffed vegetables could be so appetising!